WESTFIELD, Ind. — Perhaps Eric Ebron has gone golfing a time or two. After slipping while running a route during Friday’s joint training camp practice against the Baltimore Ravens, Ebron found the large chunk of grass that was launched by his cleats towards the sideline and promptly repaired his divot. The soggy, rainy conditions for the Colts and the Ravens on Friday at Grand Park Sports Campus certainly weren’t ideal for either side, but in the spirit of “you play like you practice,” the teams understood the importance of battling (and remaining productive through) the elements. After rain had fallen in the Westfield, Ind., area off and on the last couple days, the Colts woke up on Friday morning wondering if they would be moving their second-to-last training camp practice of 2018 — and their first of two with the Ravens — into the indoor facility at Grand Park. But because both teams would prefer to practice on two full-sized, 100-yard fields (the indoor fields at Grand Park are 80 yards in length), and because the Colts wanted to try their best to accommodate as many fans as they could, Friday’s practice remained outdoors. So when the session got underway around 1:30 p.m., players doing individual and positional drills immediately found they had to dig in a little bit more to ensure better footing. And about halfway through the practice, a heavy rain began falling in the area, which turned into a light drizzle by the end of the day. With slippery footballs and at-times tough footing, Colts head coach Frank Reich said his team accomplished what it wanted on Friday — even if he had to dial things back a little bit as far as what all the offense, defense and special teams units could really do. 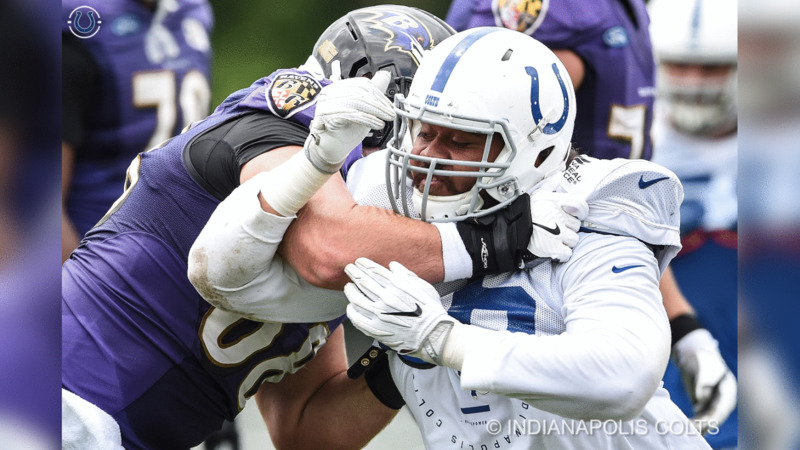 The Colts and Ravens return to Grand Park on Saturday for their second and final joint practice, which is scheduled to begin on the outdoor fields at 1:30 p.m. Colts City is scheduled to be open from noon until 4 p.m.
Saturday will also represent be the 18th and final day of practice for their inaugural training camp at Grand Park. Then, the Colts and the Ravens do battle Monday night in a preseason matchup at Lucas Oil Stadium. As Reich alluded to, the Colts can always have control of the elements in their home games, but the work put in Friday was valuable, nonetheless.